Traditional sushi, which is known as nare-suzhi, originated from South East Asia in the 4th century. The term ‘sushi’ which means ‘sour tasting’, refers to the method of keeping gutted fish packed in rice for preservation and fermentation. This practice which can be traced back to Northern Thailand involved curing meat or fish and then wrapping it in rice to prolong its freshness. It was then left to ferment for several months before being consumed. The original process, which used salt, caused the enzymes in fish to breakdown their tissues which in turn produced a slimy substance that could be scraped away before consumption. However, the rice did not initially form part of the dish and was discarded before consumption. This changed during Japan’s Muromachi period when vinegar was added to the rice. Originally intended to improve the fermentation process, the inclusion of vinegar also improved the overall flavour and led to more and more people consuming the rice as well. Sushi continued to develop in Osaka and it was here that the seafood and rice were first pressed into wooden moulds before being served. This became known as Kansai, which eventually found its way to Edo in the 17th century. The dish was popularised by a chef named Hanaya Yohei. Yohei was the first to utilised freshly caught fish which meant that fermentation was no longer required. He also added vinegar and salt to the rice before hand-pressing it. Known as Edomae zushi, the dish became popular in Edo and resulted in countless stalls and carts opening around the city to cater for a burgeoning demand for sushi. While both Kansai and Edo style sushi remain very popular, it is Edo sushi that more closely resembles modern, Western sushi as we know it today. Following the Great Kanto Earthquake of 1923, land prices in Edo decreased markedly. This allowed sushi vendors to purchase rooms and move their sushi businesses indoors. Sushi restaurants and establishments soon started to replace the stalls and carts. Advanced methods of refrigeration and better shipping practices caused a surge in popularity during the 1970s with establishments opening up across Japan. By this time, Sushi had evolved from a local delicacy to a national dish. The popularity of sushi became international during the late 1970s as Japanese immigrants took their sushi-making skills to countries like the US. Because of Japanese business expansion during the period, there was a big demand for sushi. As a result, more and more sushi restaurants started to open in order to cater for overseas Japanese businessmen. It during this period that sushi chefs started to cater for American tastes. A chef by the name of Ichiro Mashita was one of the first. He invented the California Roll which was the first type of sushi made primarily for a western market. It provided the perfect introduction to those wary of eating raw fish as part of a meal and became one of the most popular forms of Western sushi in the world. 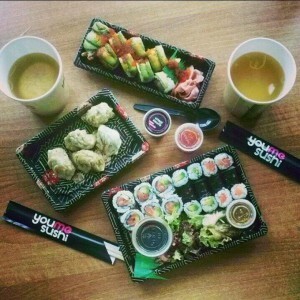 If reading about the history of sushi has given you a craving for fresh Japanese cuisine, order your sushi online now!